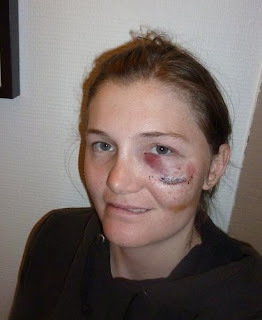 News, Updates and usually Good Stories: Alpe D'Huez and 17 new stitches in my face! Alpe D'Huez and 17 new stitches in my face! It has been a long time since I wrote. I feel like I have not stopped in weeks. I had an accident in Alpe D'Huez at the World Cup on the 11th January. I caught my ski edge coming into the final jump in qualification and found myself doing my first rodeo flip, which I certainly didn't land. Rather, crumpled in a heap on the flat. I had a pretty good black eye, a really swollen cheek, and 17 new stitches in my face, but to be honest, this looked pretty savage, but didn't hurt that much. Unfortunately I smashed my right knee up and strecthed the ligaments in my ankle...these both hurt a lot! I took a week off and was hoping it would all clear up and I could get back on skis. Huge thank you to Sarah Verlaan for having me to stay for so long in Zurich! My leg wasn't get any better and something certainly didn't feel right, although i did have stability in the knee. So I decided to go to a sports doctor in Zurich and get a professional opinion, so I don't go and make something small into something big. The doctor suspected torn meniscus and stretched ligaments and sent me off for an MRI. After 12 days off, finally I got the results back and I was fortunate enough to escape with only "extensive bone bruising" and the stretched ankle ligament. So off I trotted to Grasgehren Germany on my own to get back into SX! I arrived in Germany totally alone. No Team mates, no coach, no support. I strapped up my ankle to the best of my ability and I stood in the starting gate honestly, scared stiff! My arms were shaking, legs, and all I could think was...please don't hit the back side of that large double! Infact I don't recall being that frightened in the last 2 years. I basically would land a jump then try to ski on one leg, I went there with only one aim, and that was to forget the crash and go to World Championships with a fresh head, even if he body wasn't fresh. So I successfully completed the competition, a huge thanks to the Swiss team for letting me use their tuning bench, I was slowand in pain, but the good news was I was off to World Champs no longer thinking about my crash in France. Next stop, Salt Lake City, Utah, USA! 21st at World Champs and beyond!